Today when you mention 'Beehive' in a military context most people think of the Beehive rounds that came to be well known in Vietnam. These were clumps of flechettes blasted down range from large calibre guns, and the big daddy of the lot was the 152mm Beehive round fired by the Sheridan tank. There were, however, another set of weapons known as Beehives. These were explosive charges developed by the British and are still manufactured and used today. 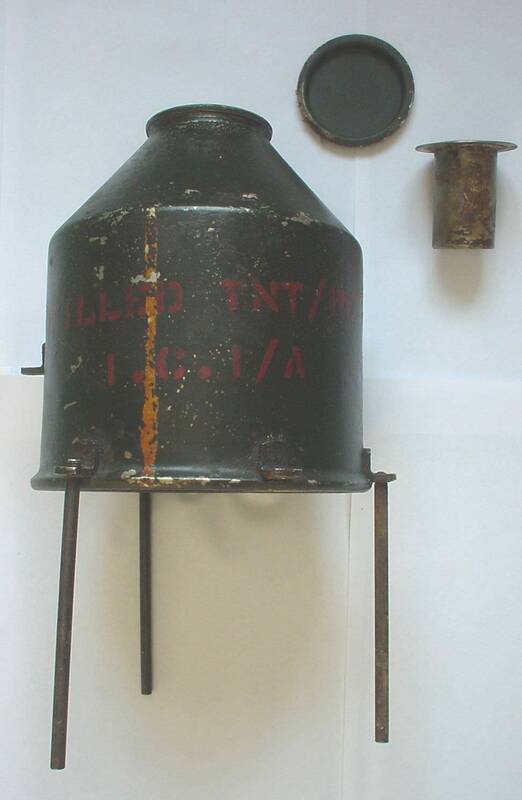 A modern Beehive charge, you'll note the shape is slightly different to a WWII version. The Beehive charge first came to life from the fertile minds at MD.1, also known as Churchills Toyshop. This group of inventors created all sorts of curious weapons for the British and were often involved with projects with other departments. Possibly the most well-known was the PIAT, although other important examples were weapons like the Hedgehog and limpet mine. 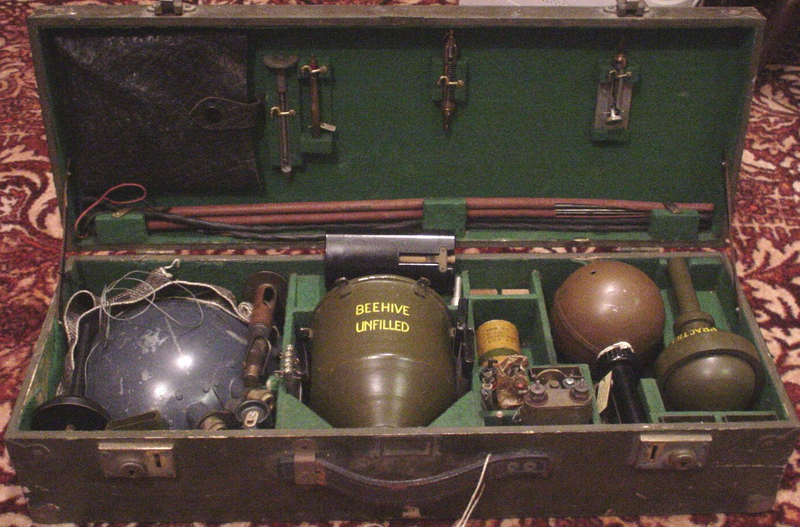 Where MD.1 excelled, and the reason why it likely got its name, was with explosive devices and items for use by the Special Operations Executive. SOE's remit was to cause as much havoc as possible, in a covert manner, in occupied countries. To this end they were heavily involved with various countries resistance movements, supply arms and equipment, training and advice. SOE also had a part in working with the Auxiliary Units on mainland Britain. These units were the people who would stay behind after a German invasion to inflict as much grief on the Germans as they possibly could. To support this work, one of the officers of MD.1, Captain Stuart Macrae, travelled around the country to various Auxiliary Units to offer training. He carried with him a suitcase loaded with all the goodies MD.1 could devise. Sitting there, in the middle of the box is the Beehive. 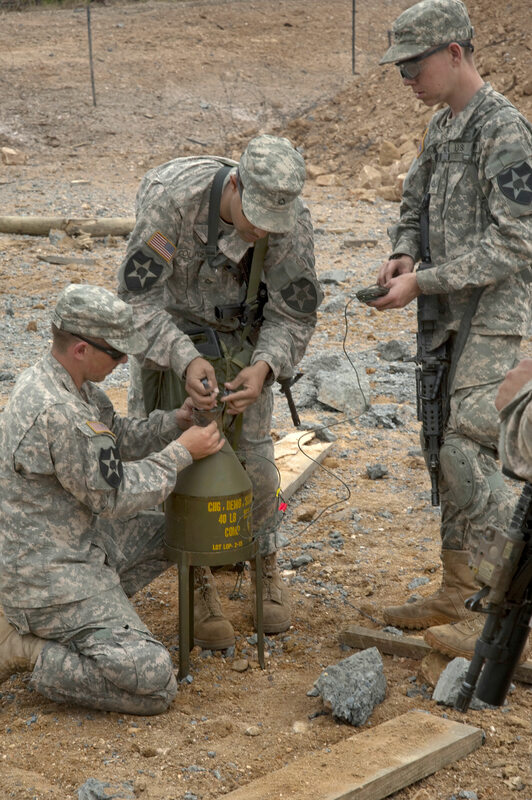 This particular version was a version that when filled weighed in between 10-12 pounds (depending on source) and had 6.75lbs of explosive. The hollow charge cavity was aimed out of the bottom of the warhead and standoff distance was provided by the legs that attached to the bottom of the device. It was the size of warhead most common and was used throughout the war by the Royal Engineers for attacking concrete structures, blowing holes in walls between houses and most commonly to create a hole in the ground. 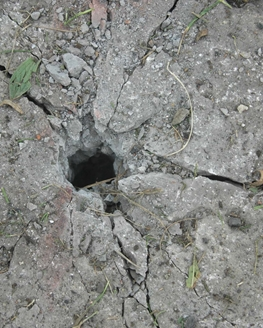 After making the hole, further explosives could be placed at the bottom of the hole to make a much bigger crater for assorted uses. The Beehive came in several sizes, the 6/12lbs above (that's 6lbs of explosive and a total weight of 12lbs) and 16/25lbs, 35/50lb and a 75/100lb. In early 1944 the latter two sizes were used in several studies by the Department of Scientific and Industrial Research (DSIR) for the use of such charges against pillboxes and concrete fortifications to find the ideal combination of diameter and weight. A first batch of tests using a 75/100lb device suggested that when fired against a 5ft thick concrete wall it would produce enough debris to neutralize the inhabitants, indeed the shock-wave was judged sufficient to do so alone. DSIR wanted confirmation of this so a series of tests were arranged in May 1944. 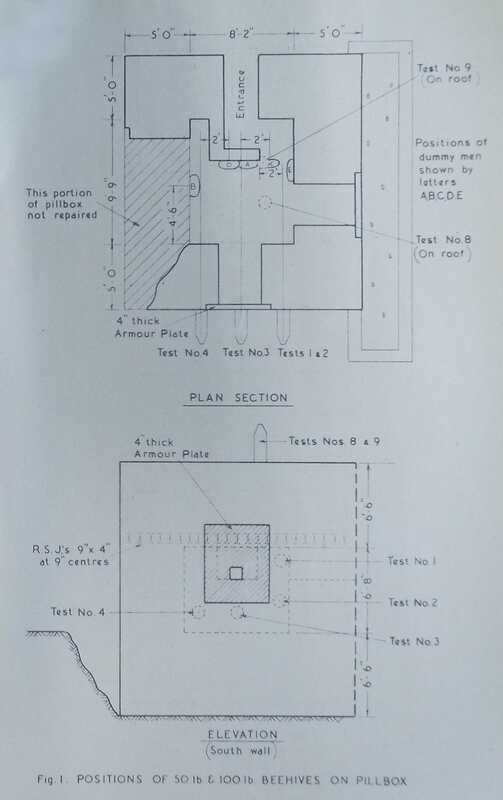 The tests were carried out against a copy of a German bunker design which had been built at Bovington, the walls were 5ft thick with a roof 6ft thick. The walls also had 9in steel reinforcing and the roof had 4x9in RSJ's inserted into it. Inside the bunker the roof had a metal sheet soffit (lining of a roof). Inside the bunker sandbags were nailed to planks of wood to represent the occupants of the bunker to assess the effects of the blast. Nine charges were detonated, six against the bunker and another three against a 6ft concrete wall, built separately. All produced an entry hole about 7in wide and an exit hole about 3in wide, although there were minor variations. The 50lbs charges containing between 30 and 35lbs of explosive depending on the experiment, blasted between 120 and 240 pounds of fragments into the interior of the bunker. This blast of material would catch anyone within a 45-degree cone for certain, in multiple places. People within a 90-degree cone might be hit. For attacks against the 6ft wall two 75/100lbs versions were used, with a third charge being made up of two stacked 35/50lb charges. The stacked version produced very similar results to the 75/100lbs version, with roughly 250-300lbs of debris blasted through the wall. This reason is likely why the 75/100lbs Beehive was declared obsolete shortly afterwards as simply stacking two charges would have the same effect but would reduce a logistical element and meant you only needed to carry and supply a single type of charge. Both a 35/50lb and 75/100lb were tested against the roof of the bunkers. Here the results were disappointing as only about 10-20lbs of material entered the bunker. The rest was caught by the steel used to make the soffit. The utility of the 6/12lbs Beehive charge can be seen by the fact variants of it are still in manufacture today. Although the shape of the charge seems to have changed slightly it is likely that as the principles behind HEAT warheads have become better understood the design has been refined. There is one anecdote of the use of the modern Beehive. In Vietnam the allied forces wanted to knock out a Fordson Major tractor being used by the local VC to tow a trailer full of weapons. The tractor had been stolen from a local French plantation. Due to it being French property it was suggested to the men of an Australian SAS unit that the destruction should be deniable. Lacking accesses to any anti-tank mines the SAS men obtained some Beehive charges. They linked four Beehives and four Claymores together on the same circuit. Due to the likelihood of secondary explosions from the tractors cargo these had to be detonated by a pressure plate. The pressure plate was constructed from parts from a Landrover suspension, a radio and assorted junk lying about such as beer cans and kitchen ware. Unsurprisingly the explosion which resulted when the tractor drove over the pressure plate was rather large and the tractor and most of the 90 or so VC who escorted it were destroyed. For more details on Cpt Stuart Macrae's box, see this site.